Strategy: express the mature expressed protein using an expression vector with its own signal sequence and transfecting into Pichia pastoris (yeast). Expressed proteins are purified by HPLC and will not have a fusion protein. Bioassay: send to the ‘Species Coordinators’ to test bioactivity. Those bioactive ones will be used to produce monoclonal antibodies. Antibodies will be initially screened by ELISA using the recombinant proteins followed by screening for neutralization in bioassays. Strategy: Recombinant proteins for immunoglobulins and various cell surface molecules, including T-cell receptor chains, CD molecules and cytokine receptors are expressed for six veterinary species at Cornell University. Two mammalian expression systems are used; (1) an IgG fusion protein and (2) an IL-4 fusion protein system. 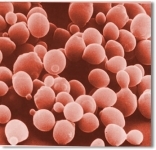 All proteins are expressed in Chinese Hamster Ovary (CHO) cells. Before the expression system was used for the Network, different recombinant equine cytokines (IL-2, IL-4, IFN-γ, TGF-β) were expressed as IgG fusion proteins. The cytokines were isolated from the IgG tag by enterokinase digestion (Wagner et al. 2005). Rrecombinant cytokines and cell surface molecules were already used for successful monoclonal antibody production (Wagner et al. 2006, 2008a, 2008b, 2012, Kabithe et al. 2010, Lee et al. 2011a, 2011b, 2012). The same system is now being used to express cell surface molecules and immunoglobulins for all six species as N-terminal proteins (Fig.1A). To express C-terminal proteins, a fusion protein system based on IL-4 is being used (Fig. 1B; Wagner et al. 2012). 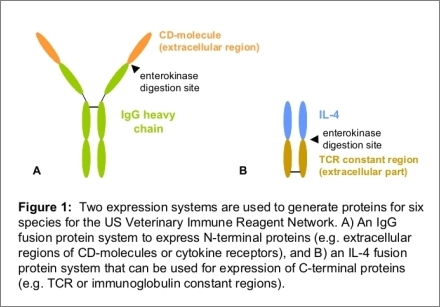 The first recombinant proteins that have been expressed with this system for the US Veterinary Immune Reagent Network are T-cell receptor constant region domains. These include the bovine TCRγ and TCRδ proteins and the catfish TCRα and TCRγ constant regions. TCR genes of the horse, pig and trout are being processed. Other molecules that have been expressed with the fusion protein system include equine CD19, CD23, CD25, CD28, CD40, FcεRI α-chain, NCR2 and NCR3; cattle IL-23R, CCR7, and IL-10Rβ; pig IL-4Rα, IL-13Rα1, CD19, NCR2, and NCR3; chicken IL-2Rα, IL-1R, IL-7R, IL-10Rβ, and CXCR4. Proteins are purified from serum-free large scale cultures using Protein G (IgG fusion proteins) or anti-IL-4 sepharose (IL-4 fusion proteins). Purified proteins are tested by SDS-PAGE and protein concentrations are determined by BCA. Equine and porcine were/are used for monoclonal antibody production at Cornell. Cattle proteins, catfish and trout TCRs, and some of the chicken proteins were sent to Dr. Baldwin's lab at the U Mass Amherst for monoclonal antibody production. Other chicken proteins were sent to Dr. Lillehoj's lab in Beltsville for antibody development. Wagner B, Robeson J, McCracken M, Wattrang E and Antczak DF. 2005. Horse cytokine/IgG1 fusion proteins – mammalian expression of biologically active cytokines and a system to verify antibody specificity to equine cytokines. Vet. Immunol. Immunopathol., 105: 1-14. Wagner B, Hillegas JM and Antczak DF. 2006. A monoclonal antibody to equine interleukin 4. Vet. Immunol. Immunopathol., 110: 363-367. Wagner B, Hillegas JM, Brinker DR, Horohov DW and Antczak DF. Characterization of monoclonal antibodies to equine interleukin-10 and detection of T regulatory 1 cells in horses. Vet. Immunol. Immunopathol., 122: 57-64. Wagner B, Hillegas JM, Flaminio MJBF, and Wattrang E. 2008. Monoclonal antibodies to equine interferon-α (IFN-α): New tools to neutralize IFN activity and to detect secreted IFN-α. Vet. Immunol. Immunopathol., 125: 315-325. Kabithe E, Hillegas, J, Stokol T, Moore J, Wagner B. 2010. Monoclonal antibodies to equine CD14. Vet. Immunol. Immunopathol.,138: 149-153. Lee SH, Lillehoj HS, Park MS, Baldwin C, Tompkins D, Wagner B, Babu U, Cacho ED, Min W. 2011a. Development and characterization of mouse monoclonal antibodies reactive with chicken CD80. Comp. Microbiol. Immunol. Infect. Dis., 34: 273-279. Lee SH, Lillehoj HS, Jang SI, Baldwin C, Tompkins D, Wagner B, Parcells M, Cacho ED, Hong YH, Min W, Lillehoj EP. 2011b. Developement and characterization of mouse monoclonal antibodies reactive with chicken interleukin-2 receptor-alpha chain (CD25). Vet. Immunol. Immunopathol., 144: 396-404. Wagner B, Hillegas J, Babasyan S. 2011. Monoclonal antibodies to equine CD23 identify the low affinity receptor for IgE on subpopulations of IgM+ and IgG1+ B-cells in horses. Vet Immunol. Immunopathol., 146: 125-134. Lee SH, Lillehoj HS, Jang SI, Lee KW, Baldwin C, Tompkins D, Wagner B, Del Cacho E, Lillehoj EP. 2012. Development and Characterization of Mouse Monoclonal Antibodies Reactive with Chicken CD83. Vet. Immunol. Immunopathol., 145: 527-533. Click here for current immunization and monoclonal antibody production protocol. Click here for current ELISA protocol for mouse monoclonal antibody isotyping. Strategy: MAb to all expressed cell surface proteins will be produced as well as to selected cytokines and chemokines as funds permit. Several strategies are in use including the adoptive transfer method which works well for mice with high titers of circulating antibody that otherwise neutralize the antigen boost. CFA or Gerbu adjuvant given initially with antigen followed by boost with IFA or Gerbu; adoptive transfer of splenocytes (IP) to naïve mice after boosting. Fuse 3 days after transfer into naïve mouse along with antigen.